EasyTurf is scheduled to showcase their complete synthetic grass playground system at the National Recreation and Park Association (NRPA) annual conference in Houston, TX, Oct. 8, 9. The display includes an interactive look at the innovative engineering involved in the creation of their IPEMA certified products and multi-surface playground system for architects, city planners and engineers. EasyTurf uses a proprietary 100 percent permeable artificial grass playground surface backing, MaxxFlow, for unmatched drainage capabilities. Unlike a grass playground, rain will not turn your EasyTurf surface into a mud pit. Play can resume shortly after even the heaviest rains. EasyTurf recently performed extensive lab testing to test common bbq spills effect on turf. The video and EasyTurf staff will also be available to explain how food and food debris can be easily rinsed through EasyTurf, but get caught in other synthetic grass surfaces, quickly creating a mold and insect breeding ground. EasyTurf is the choice turf for children and their parents, and it’s also the best choice for parks’ number two customers – dogs. 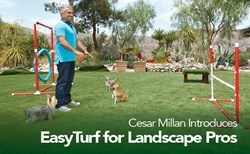 World renowned dog whisperer, Cesar Millan recently introduced EasyTurf for pet owners. Millan says drainage was critical in his decision to partner with EasyTurf on the 10,000 sq. ft. installation of artificial grass at his Dog Psychology Center in Santa Clarita, Calif. According to http://www.nrpa.org, NRPA expects more than 30,000 park and recreation professionals and will focus on three main pillar areas: Conservation, Health & Wellness and Social Equity. It is the one truly comprehensive forum where participants can fully assess the “big picture” on these issues and see exactly how the economic and market forces, new technologies, regulatory developments and industry trends all merge to shape critical decisions on both a community and national level. EasyTurf’s artificial grass system meets requirements of a green playground, park and recreational project which include preserving, enhancing and making viable living/playing space, while at the same time providing a cost-saving, environmentally-friendly landscape solution. EasyTurf also boasts projects that include making urban areas and rooftops more livable and vibrant through sustainable design. Some of the cities leading these green initiatives include Washington DC, Chicago, New York and Toronto, although mass media reports every major city is taking an interest in these types of projects. EasyTurf, the landscape division of FieldTurf, plays an important role in environmentally friendly recreational fields, playgrounds and energy conservation plans for communities throughout North America. EasyTurf is North America’s preeminent source for landscaping, offering state-of-the-art synthetic lawns for realistic, beautiful, easy-care residential and commercial landscapes, providing specialty synthetic grasses engineered specifically for military surfaces, commercial and residential athletic and playground surfaces, putting greens, and for pet-friendly landscapes. EasyTurf product advancements in the synthetic grass industry have led to massive growth for the Vista, California-based leader in life-like artificial lawns that stay beautiful year round.